Apparently the law of diminishing returns does not apply to 3 and a half year olds. I could cite 20 examples, but you would probably find each one less interesting, so I will stick to a few. For Easter Robin’s grandmother hid a couple dozen plastic eggs around their house for him. Each was filled with roughly the same number of M&Ms. Robin’s response on finding each one was the same–complete and total awe. He was as dumbfound on discovering the last as the first. Simply could not believe life’s abundance! And not just at finding each egg, but he sustained his excitement each time he opened a new egg to reveal its identical contents. Dinner times on the deck are peppered with the same announcement, repeated incredulously. “Look, Mom! A plane!” One after the other after the other. He has such a low threshold for enthusiasm. 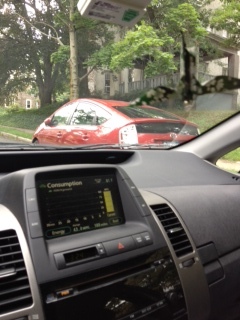 I used to say it was only worth a comment when three or more Priuses pulled up to a stop sign at the same time. That’s what I called a Prius Nexus. But even that had grown unremarkable. It’s commonplace, really. Three of the same color in one place arouses no response from me. There are now four Priuses that live on our block. Two of them are dark gray, just like ours. I keep waiting for the day when the parking universe aligns and we all end up parallel parked in a row–three gray hybrids bumper to bumper to bumper. That might raise my eyebrows. It would no doubt throw Robin into seizures of euphoria. It would be like his Happiness Rapture, really. He might simply disappear from the intensity of his joy. One person’s saturation is another’s (three-year-old) jubilation. I wish I could muster Robin’s euphoria over the situation on our block. But most mornings I just try to not get into the wrong car. 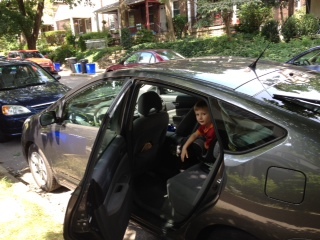 This entry was posted in City living and tagged awe, enthusiasm, hybrid, Prius on July 31, 2013 by aszyper. Park here! We dare you. I live in a neighborhood with trees, gardens and parks. I can’t buy a cup of coffee or a loaf of bread without running into someone I know. Sometimes it’s a bit like Mayberry here in the –119. It takes the candor of a kindergartener to snap me out of my mirth. “That guy did a really bad job parking.” My six-year-old neighbor announces this at full volume, as we unload the car we have pulled in neatly in front of the white one she’s pointing to. I bite my lip to contain hysterical laughter. I know she didn’t hear our conversation because the windows were closed; the observation is completely true and completely hers—said without malice, simply observed and noted. This is life in the city. We have no garage, so on-street parking is a way of life, a daily routine as unremarkable as toast and coffee. I don’t feel we grouse about parking like others do. We only drag chairs and trash cans into the street to guard parking spaces when we’ve shoveled out a spot in heavy snow. Otherwise we quietly jockey for a space on the block like everyone else. Or so I thought. I was startled the first time I heard Robin, age 3, grumbling as he parked his Matchbox cars and vans. 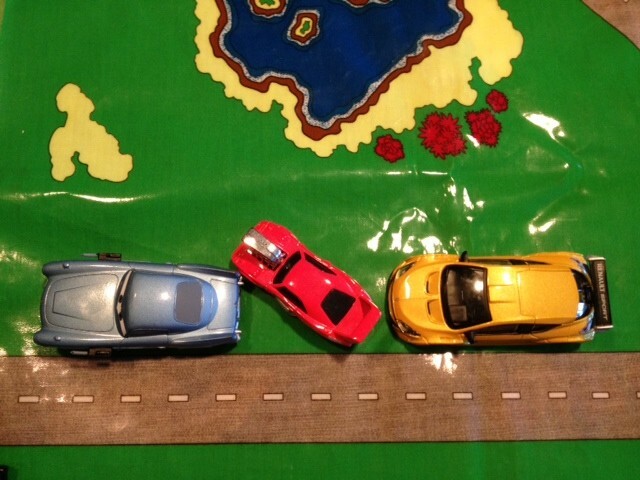 “Well, I guess this is the best I can do,” he muttered to no one as he swiped a red convertible up alongside a curb in the 2D city of his play rug. Then the black conversion van with the flames painted on its sides chimed in. “See if we can get closer.” It continued this way until supper, each car circling and complaining about the spot they finally procured. Robin throws bizarre fits sometimes, tantrums for the most unlikely and unfixable things. After we dragged him to a couple open houses one weekend, he became fixated on having a garage. I don’t even remember if either of the homes we walked through had one. But his cry was undeniable. “Mommy, I want a garage! I want a garage! I want a garage RIGHT now! We neeeeeeed a garage!” He repeated it in hysterics as if he were asking for a cookie or something from a gift shop. Who is this child? And is he baiting us for a move to the burbs? In the meantime, if you drive over to visit us, consider yourself warned. Mayberry may have had parking lots. But this is the city. If you park poorly on our block, the kiddos will call you on it. This entry was posted in City living and tagged candor, cars, garage, Mayberry, parallel parking on July 3, 2013 by aszyper.